We had an amazing 3-day tour. The tour guides are great, Helen, Cho and Jenny. They are all knowledgeable and very good in English and very much approachable. Jenny is excellent in planning 'coz we had a perfect timing when we arrived Mutianyu. I highly recommend the cable car and the Toboggan slide as well. I learned a lot about ancient history of Beijing, the culture and the beliefs, pretty much we were able to go to all that's included in the package. However, I would not recommend this to senior or older people who will have a hard time in walking because most of the time you have to walk fast to beat the line, the influx of too many people and to beat the traffic so you have to be early as well. You may want to remind the tour guides of the bottled water covertly because others might have a different package than this.All in all, this tour is highly recommended! Great job to Jenny and the team! I cant put into words how incredible this adventure was! our group of three saw all the important sites, visited the pandas, all were outside doing their thing, they are so special, chinas pride and joy, for good reason. the forbidden city is massive, beautiful and so historic. the great wall, we visited mutianyu, was breathtaking in its scale, workmanship, and afforded us a spectacular view of the mountain terrain, and I mean mountains, they built this wall on. the food was delicious and plentiful, the guides were true pros with knowledge to burn, the van was new, I would do this again in a heartbeat! also, I went in november, so there were no crowds anywhere, only the local folks, who were very nice, I was included in many selfies, it was such fun on every level! This tour definitely hits all the must-see sites in or around Beijing. It is super convenient as you get picked up directly from your hotel. The tour guides are very knowledgeable and learn quite a bit about each location. The only thing is that there are mandated shopping stops that you have to stop at, but it keeps the price low and also is items China is known for Silk, Pearls, Jade, etc.. Definitely recommend. Probably one of the best ways to see this incredible country! I quickly learned barely anyone speaks english unless theyre in a tourism driven job so a guide is extremely helpful! Every guide we had was extremely knowledgeable and friendly! They have you stop in tourist shops like jade factories and such which can annoy some but I really enjoyed because you knew you were getting quality. The restaurants were good except for the one offered at mutianyu great wall. The company was also very accurate on pickup times and making sure the group was comfortable but got a good amount of time at places like the great wall. Our last day my dad and I were the only ones on the trip that day so we had a private car and more of our own time to see things which was very nice! 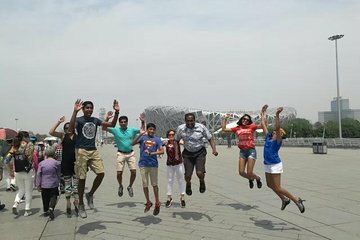 Wow- my Three-Day tour of Beijing was awesome! My tourguide, Jenny completely blew me away. From the minute the tour started I was pleased. My guide was so warm and welcoming, she instantly became my friend. She was considerate and anticipated any needs or concerns that I had. I lucked out as well and had a private tour with a super nice black town car and private driver! I thought that touring in the middle of summer would be extremely crowded, but Jenny and our drivers literally drove us RIGHT to the Great Wall, Summer Palace, Temple of Heaven with no problems. We didn't have to wait in any lines as the tour takes care of all the hassles of tickets and admission lines. We avoided most crowds and overheating. I couldn't speak higher of my experience and would highly recommend this tour if you want to see the top sites in style! We had a fantastic tour . Jennifer ,our guide for the first 2 days was very professional ,had knowledge about the areas we visited and was always helpful .On the second day we even got a surprise free foot massage after the walk up the Great wall ! Jennifer made our visit very memorable ! This is a great tour. Excellent value for money and jammed packed with plenty of activities throughout the 3 days. We had Jenny as our guide who was a really friendly, helpful and informative host. Highly recommended and overall probably the best tour for first time visitors to Beijing. Thanks Jenny! Our tour guide and driver for the first day of our tour where very prompt and informative. We where able to swap days around as the Forbiden City is closed on Mondays. For the following two days we had a different guide and driver. Guide meets us in the lobby on the first day and then we had to walk to our bus. We where unable to walk around Tiananmen Square as this was closed. We where dropped in the street on return home not our hotel and then told this is where we will pick you up tomorrow. Day three we where picked up from the street where we where left. As the Olympic precinct was closed we could not visit, this meant that we where dropped of at 1.30pm on our third day. I do not think this is a good quality tour as you would think if the sites are not open replacements would be suggested not cut your tour short.. This was just amazing...the people from the agency Marco Polo Tour were very helpful all the time and the tour went just smoothly. The guides rotate however, I had the chance to have Selina a couple of days. She have a good english, good knowledge and a outstanding spirit. I strongly recomend this people and tour if you ever go to beijing.